After a brief career in the film industry, the artist moved out of New York in the mid-nineties to rural Vermont. The open and bucolic settings of the countryside allowed Mooney new sources of inspiration. 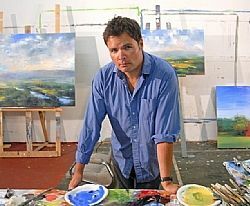 Today, Mooney devotes himself full time to his art at his studio in Vermont.